A 20th century winery has traded barrels of grapes for family gatherings thanks to the efforts of Extrastudio. 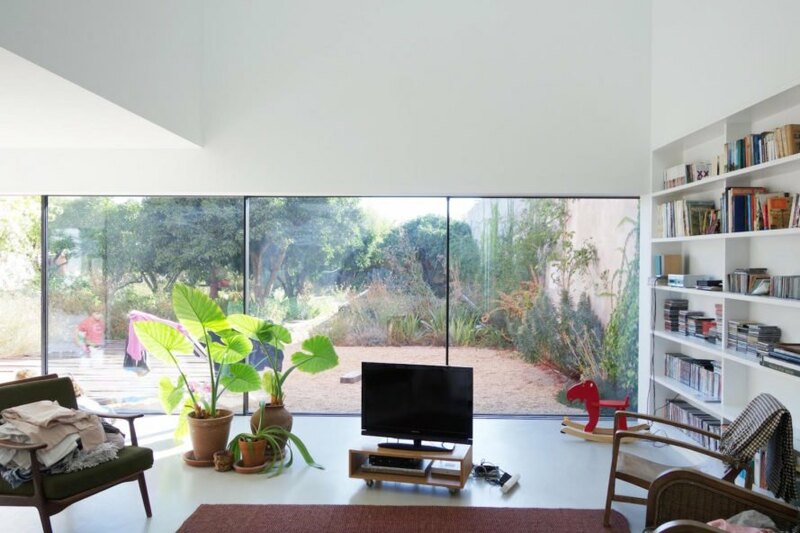 The Lisbon-based architecture firm transformed the former winery into a light-filled home in Azeitao, a small village in southern Portugal. The architects retained the gabled structure’s original building footprint, but refreshed its look with a red-colored render that gives the building its new name—the Red House. Built in the 20th century by the client’s grandparents, the winery has been overhauled into a minimalist and modern dwelling complemented with a black-bottomed pool. Despite its contemporary interior, the home exudes rustic appeal thanks to its gabled roofline and uneven application of red-colored render. The facade’s patchy and pinkish appearance, which changes over time, echoes the look of the original weathered walls. 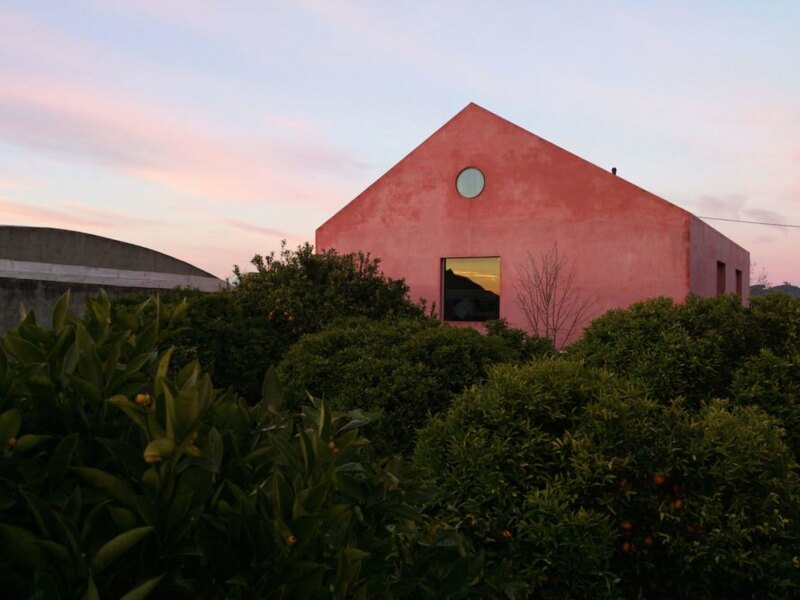 “A natural red pigment was added to the mortar, to reinforce the building’s presence, allowing the house to age gradually and changing its tonality, without ever requiring a coat of paint,” said the Extrastudio, according to Dezeen. 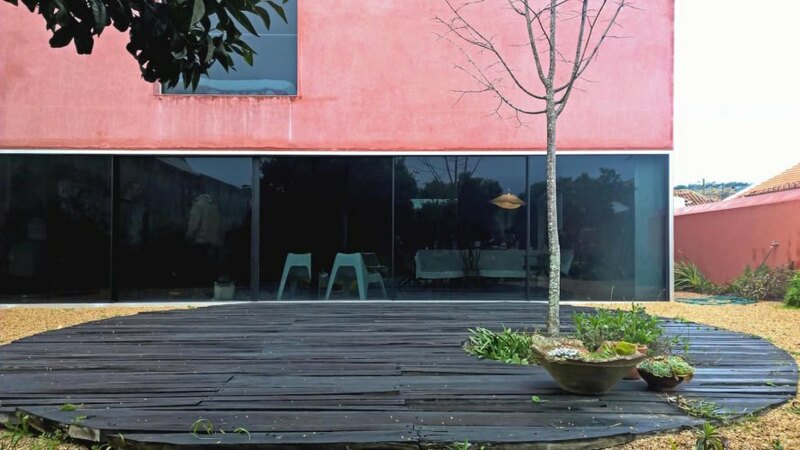 “Over the days and months, the colour of the house alters, lighter or darker depending on the humidity, almost black when it rains.” The render derives its color from powdered brick and heat-treated clay, a material that protects the facade against weathering damage. 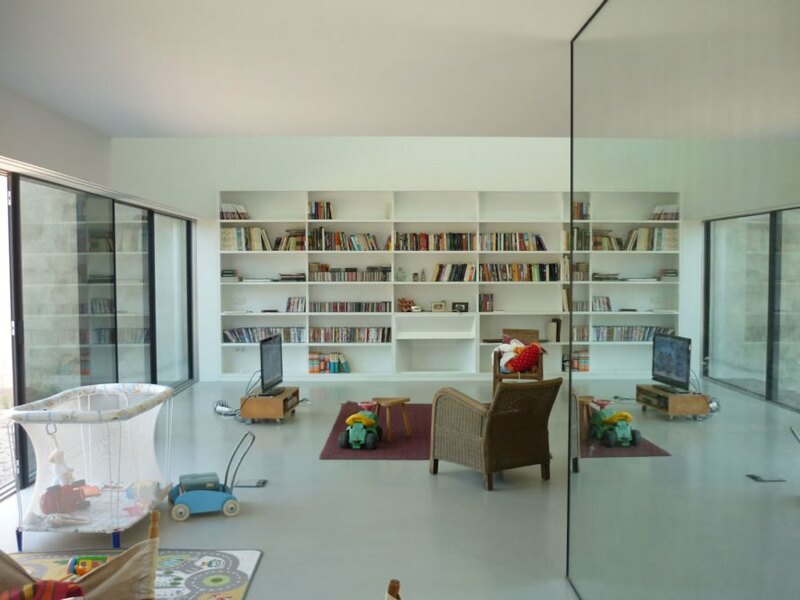 Natural light fills the Red House, which is dominated by white-painted interiors, pale concrete floors, and tall ceilings. Mirrors line the living room to further reflect light. Full-height black glass doors stretch the width of the garden-facing facade on the ground floor and slide completely open to expand the living space to the outdoors. The ground floor comprises the communal areas, arranged in an open-plan layout, while the bedrooms and bathrooms are placed on the floor above. 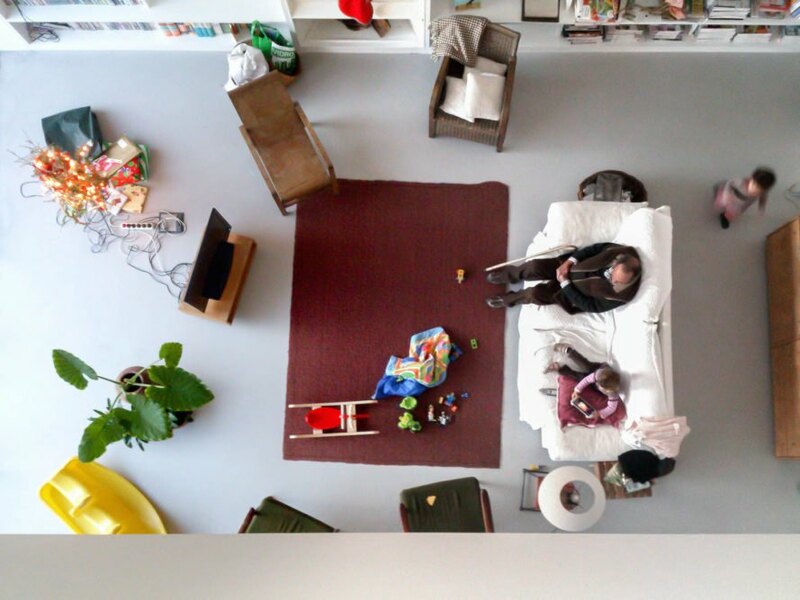 A small room occupies the attic. Built in the 20th century by the client’s grandparents, the winery has been overhauled into a minimalist and modern dwelling complemented with a black-bottomed pool. Despite its contemporary interior, the home exudes rustic appeal thanks to its gabled roofline and uneven application of red-colored render. The facade’s patchy and pinkish appearance, which changes over time, echoes the look of the original weathered walls. 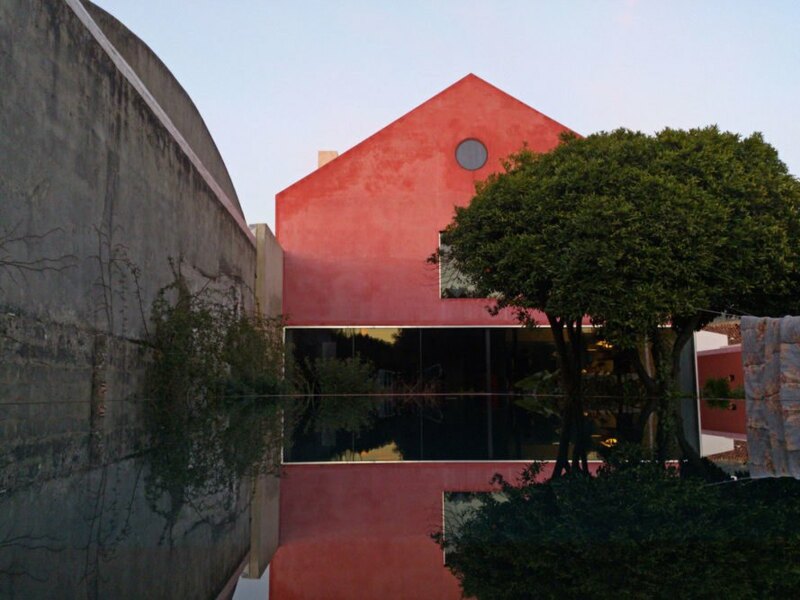 "A natural red pigment was added to the mortar, to reinforce the building's presence, allowing the house to age gradually and changing its tonality, without ever requiring a coat of paint," said the Extrastudio, according to Dezeen. "Over the days and months, the colour of the house alters, lighter or darker depending on the humidity, almost black when it rains.” The render derives its color from powdered brick and heat-treated clay, a material that protects the facade against weathering damage. Natural light fills the Red House, which is dominated by white-painted interiors, pale concrete floors, and tall ceilings. Full-height black glass doors stretch the width of the garden-facing facade on the ground floor and slide completely open to expand the living space to the outdoors. The ground floor comprises the communal areas, arranged in an open-plan layout, while the bedrooms and bathrooms are placed on the floor above. A small room occupies the attic.